The rubber transfer molding process is used to produce a full range of precision molded rubber, rubber-to-metal, rubber-to-fiberglass rod bonded components etc. The benefits of transfer molding are seen in mid to high volume production, tight tolerance, over-molding and applications with colored or translucent materials. The transfer molding process combines attributes of both injection and compression molding making it an ideal manufacturing method for many applications. Transfer molding, unlike compression molding uses a closed mold system. The process begins with a piece of uncured rubber that has been preformed to a controlled weight and shape. The preform is placed into the portion of the mold called a “pot” located between the top plate of the mold and the ram. 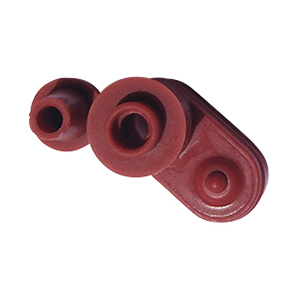 The ram is closed which distributes (transfers) the uncured rubber into the cavity(s) through a runner and gate system. The material is held under high pressure and temperature to activate the cure system in the rubber compound (rubber is vulcanized). The cycle time is established to reach an optimal level of cure. At the end of the cycle, the parts are removed or ejected from the cavities and the next cycle begins.